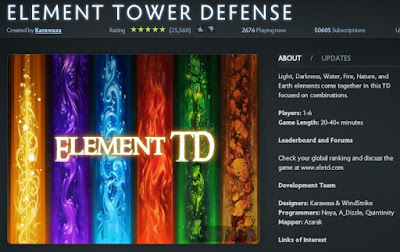 From the Warcraft 3 Element TD development team comes forth Element TD in Dota 2. The Dota 2 version of Eletd tries to stay true to the original and it has not failed. ElementTD 's release on the Dota 2 engine is a sign that more WC3 favorites are being ported. To start playing, just click ARCADE inside DOTA 2 and look more Element TD.